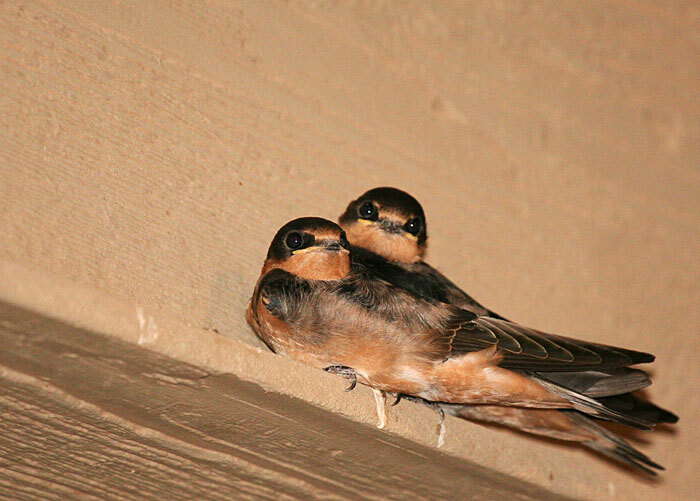 The second brood of front-porch barn swallows has hatched and has become the avian equivalent of teenagers, meaning that they're trying to simultaneously be completely free to do their own thing while expecting their parents to do all the important stuff for them. This has become increasingly difficult because, as far as I can tell, the parents have left for less stressful environs, leaving the two kids to fend for themselves. This is how I found them this morning around 5:30, huddled together on the quarter-inch ledge of the ceiling trim, about six feet away from the nest that will no longer accommodate them. It's a cruel world out there, and everybody needs a buddy. I wonder how long these siblings will stick together before nature pulls them in different directions? This page contains a single entry by Eric published on August 26, 2013 7:18 PM. Shoe Blues was the previous entry in this blog. The Civil Wars || The Civil Wars is the next entry in this blog.